Manzoni: civil service is trying to do too much (Image courtesy: Institute for Government). Brexit increases the pressure on the UK civil service to reform its operations and processes, Civil Service Chief Executive John Manzoni said yesterday, in comments that revealed the difficulty of making plans when the government has not won Parliamentary support for its chosen exit deal. 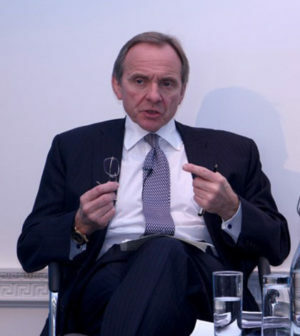 Asked how long it will take to prepare for Brexit, Manzoni replied that he’d “steal Jon Thompson” – the HM Revenue & Customs Chief Executive, who last November repeatedly told the Treasury select committee that a two-year project to build new border controls can only begin when the government has determined which systems will be required. “From the moment we decide exactly what border we want, it will take several years to put it in place,” Manzoni said. 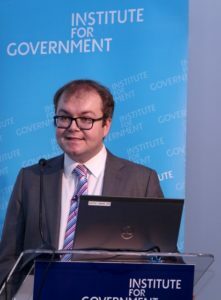 The civil service’s corporate head was speaking at the launch of Whitehall Monitor 2019: an annual analysis of the UK civil service’s size, shape and performance, produced by think tank the Institute for Government (IfG). Even including the potential two-year extension of the planned transition period, noted the IfG’s Head of Data and Transparency Gavin Freeguard, the four-year timescale for delivery is far shorter than for many much smaller government projects – with the Olympics, automatic pensions enrolment and Universal Credit benefits reforms all taking over ten years. The Whitehall Monitor also reveals a steady slide in delivery confidence over government’s major projects, which are assessed on a ‘traffic light’ system by the Infrastructure and Projects Authority. Excluding Brexit-related projects, Freeguard said, the proportion awarded a green or amber/green rating has fallen from nearly half to about a fifth since 2013, whilst those given red or amber/red scores has grown from less than 20% to 36%. Picking out a selection of the 100+ metrics in the Monitor, Freeguard highlighted the extraordinary rate of ministerial resignations under PM Theresa May. Tony Blair saw 29 ministers resign during his 10-year premiership, he pointed out, and Margaret Thatcher lost 24 in 11.5 years. But 21 ministers have quit since the 2017 general election, less than two years ago. Freeguard: ministerial turnover rates disrupting policy delivery (Image courtesy: Institute for Government). As the specialist functions expand their role in developing and managing civil servants, said Manzoni, the emergence of a “matrix structure” built around them will need to be reconciled with the traditional, vertical organisation of the departments. “One of the evolutions that Mark [Sedwill, the Cabinet Secretary] and I are discussing is how do we reflect in the governance structures of the civil service itself the fact that we have now have a matrix structure across the civil service,” he concluded. “We haven’t actually changed the structures of the civil service to reflect that matrix structure, to the point of putting functional leads on an accountable board” – one that would combine departmental and functional leaders. Good luck bringing specialists back in given current pay and rewards. Likewise a matrix structure given how pay is tied to vertical position. Since the GFC in 2008 successive governments have used austerity measures as the excuse for reducing the size of department budgets by 20-25% in every spending round (4 years). This has been achieved by drastic cuts in both the numbers of civil servants and their terms of conditions including pay, leave, pension entitlements etc. Tier 1 & 2 positions in departments were filled in many instances by individuals on fixed term contracts on double the senior civil service rates for the roles. If the post was filled internally the civil servant was awarded a paltry 6% pay increase…. no wonder so many left public service. And now the Head of the Civil Service is saying how important that civil servants are in delivering Brexit and core services and that we need more to deliver government priorities…….where was all this concern and support over the last 10 years..,, And people don’t want to work in the public service – go figure….shameful leadership….lions led by donkeys comes to mind….